Donchain Channel is a new member of the technical indicators' family in this forex trading guide. The indicator is developed by Richard Donchian. It is a trend indicator which helps to determine the direction of the trend, trend reversal and trend continuation. This technical indicator has one upper channel, a middle channel and a lower channel. Generally, the default period for this technical indicator is 20, but the traders can apply any period as required. Longer period gives infrequent but more reliable entry and exit signals, whereas, shorter period gives less reliable but frequent trading signals. A buy order when the price crosses the upper Donchian Channel. A sell order when the price crosses lower Donchian Channel. 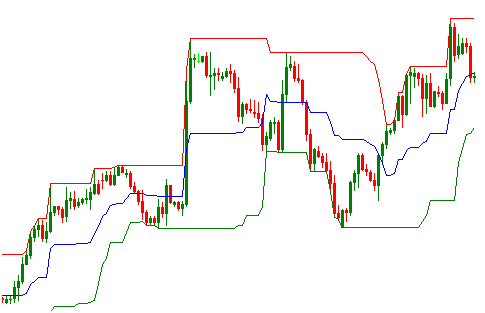 A buy order can be closed when the price penetrates 10 period upper Donchian Channel. A sell order can be closed when the price penetrates 10 period lower Donchian Channel. Above are the basic techniques of interpreting Donchian Channel. The upper Donchian Channel is considered as the resistance level and the lower Donchian Channel as the support level. The straight line portion on the upper Donchian Channel represents strong resistance level and on the lower Donchian Channel represents the strong support level. If you read my post on Darvas Box , it will be helpful to understand the trading technique with Donchian Channel.Some traders who are scalping may place orders when the price penetrating the upper and lower Donchian Channel. If you have any suggestions, questions or complements please drop a comment below.